Over the course of their career, British twins Jane and Louise Wilson have documented the highly complex and haunting architectural ruins of modernity. 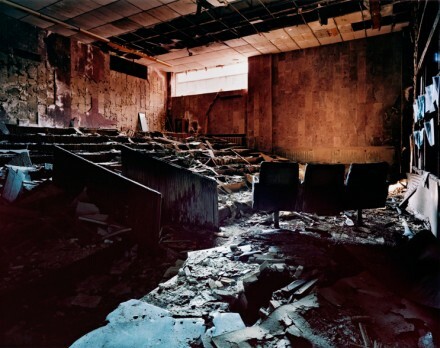 Their work depicts the near-theatrical decay of industrial and military advances of the twentieth century, or rather, turns the spaces of said decay into a theatrical space. The artists’ current exhibition at 303 Gallery combines the work from two recent projects: the photographs Atomgrad, Nature Abhors A Vacuum I, V, VI, VII and VIII, 2011; and Blind Landing, H-Bomb Test Facility, Lab 1 and Lab 4, 2012. In the Atomgrad series, the Wilsons photographed scenes from the town of Pripyat, in present-day Ukraine, a Soviet city conceived in the late 1970s to house the workers at the Chernobyl nuclear facility. Evacuated following the explosion of the nearby power plant in 1986, it has been desolate ever since. Blind Landing documents a sit-specific installation the Wilson created at the former British hydrogen-bomb-testing laboratories on the island of Orford Ness, off of the Suffolk coast. 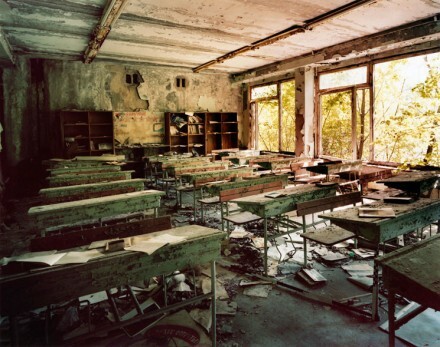 The photographs depict the public services of the city, such as the schools and hospitals, laid to waste after years of abandonment and contamination. The choice to document spaces that would have been filled with people prior to the evacuation make the photographs all the more eerie, as though they are filled with memories of past days. The buildings are trapped in time, with the rest of the world having advanced and changed, while the sites remain still and stagnant. The irony, of course, is that they have been condemned by the very science that the city was developed to sustain. The images tell the tale of the folly of industrial and military greed, and the often unconsidered risks of scientific advancement. The measuring sticks placed in the frames serve to remind the viewer that the damage cannot possibly be measured or conceived. 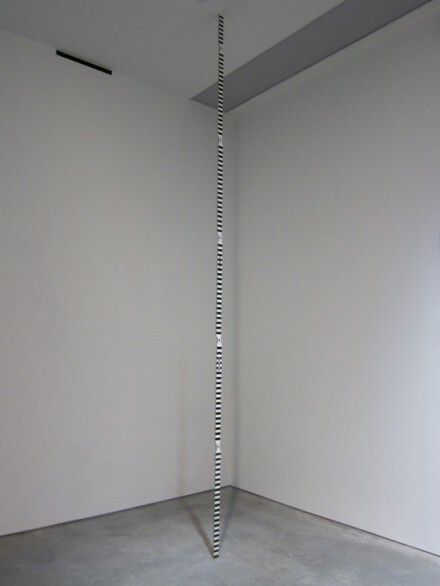 The recurring motif in the artworks is the yardstick. 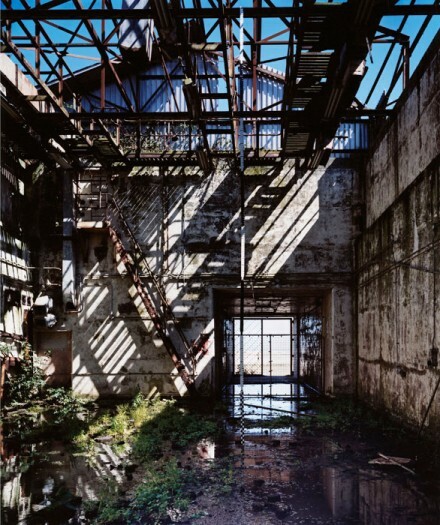 In each of the seven large-scale photographs, the yardstick is on view, occasionally discreetly hidden in the framework of the decrepit structures. 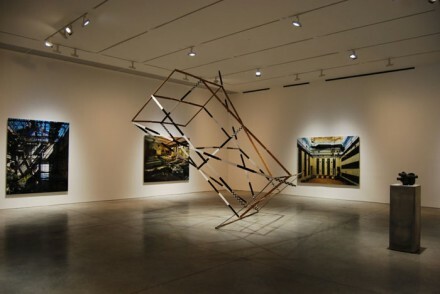 In the gallery the actual yardsticks are displayed; they are used as a medium for the sculptures that stretch from floor to ceiling, across a doorway baring entry, and occupy the center of the room in a large, geometric framework. Unlike the photographs, which depict mass disorder, the sculptures are exceptionally orderly and precise, even scientific. The exhibition also includes a bronze cast of a 35-millimeter Russian Bolex camera, placed on a pedestal. 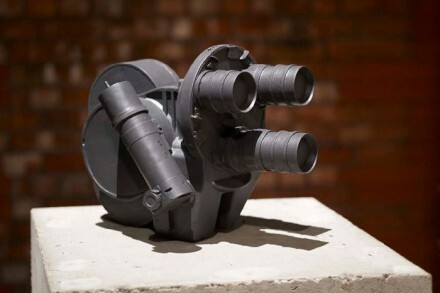 The sculpture refers to the Wilson twin’s film Toxix Camera, about the Ukrainian filmmaker Vladimar Shevchenko. Shevchenko documented the aftermath of the Chernobyl explosion and found that his film had a lot of static and distortion, caused by the radioactive disturbances of the space.. Both the film and the camera had become radioactive due to exposure. In fact, the radioactivity eventually killed Shevchenko. This piece provides a commentary on the contamination of post-disaster surveys, including the Wilsons’ own work, and the inherent toxicity spread into the future by these nuclear disasters. In a time where the world braces for the widespread effects of the Fukushima power plant meltdown, the work could not be more potent. This entry was posted on Thursday, August 1st, 2013 at 10:55 am	and is filed under Art News. You can follow any responses to this entry through the RSS 2.0 feed. You can leave a response, or trackback from your own site.